If you’re looking to find the right tire for your Saab vehicle, the tire experts here at Schmelz Countryside Saab are here to help! The following Pirelli Tires are a good match for your 9-3, 9-7X and 9-4X vehicles. Our dedicated and professional parts and service staff lead by Bob in Parts and Mike in the Service Lane can help you through choosing the right tire for your Saab and will make sure you get the best value on tires or any automotive services you may need in the Minneapolis / St Paul Area. Schedule a service appointment now! 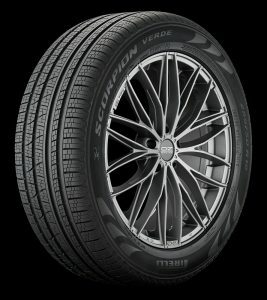 The Cinturato P7 All Season Plus is Pirelli’s Grand Touring All-Season tire designed for the drivers of touring and luxury touring cars looking for tires offering predictable handling, everyday comfort and all-season traction. Developed to be environmentally friendly, Pirelli’s EcoImpact icons confirm the Cinturato P7 All Season Plus’ contribution to the environment with regards to energy efficiency, clean air, low noise and long wear. Designed to be driven in America’s diverse weather conditions, the Cinturato P7 All Season Plus features lower weight, less rolling resistance and reduced noise while enhancing wet braking and year-round traction, even in light snow. Cinturato P7 All Season Plus tires use a tread compound that features low oil and high-silica content to reduce braking distances and rolling resistance. This compound is molded into an asymmetric tread design that blends dry handling with wet road and wintertime traction. A continuous outboard shoulder promotes steering response while the pitch sequencing and phasing of multiple inboard tread block sizes reduce pattern noise. Four wide circumferential grooves help evacuate water to increase hydroplaning resistance while engineered lateral and longitudinal sipes increase the number of biting edges to enhance wet road and wintertime traction. To enhance high-speed durability, handling ride quality and wear, the tire’s internal structure features twin, lightweight steel belts reinforced by variable-tension spirally wrapped polyamide. The Cinturato P7 All Season Plus features a progressively flexible sidewall to cut down on deformation and unnecessary dispersal of energy, thereby reducing rolling resistance. Note: Cinturato P7 All Season Plus tires feature low rolling resistance (LRR) compounds and constructions to enhance vehicle fuel economy. These tires are identified as such with Pirelli’s EcoImpact designation on the Sizes and Specs pages. Pirelli’s first “Green Performance” tire, the CINTURATO P7? ALL SEASON has been created to take full advantage of the latest materials, structures and tread pattern design in order to guarantee savings, respect for the environment, comfort and safety on all road surfaces. ENERGY? EFFICIENT: Up to 20% less rolling resistance as a result of the improved tread compound, sidewall geometry and internal tire structure. Result: Reduction of almost 4% in fuel consumption. HIGH MILEAGE: Improved performance through optimizing the tread contact area, tread compound and profile design. Result: Increased average tire life while maintaining high safety characteristics and performance. Shoulder grooves and circumferential channels allow water to flow through the tread design to resist hydroplaning and enhance wet traction. The Scorpion Verde (Italian for green) All Season is Pirelli’s eco-friendly Crossover/SUV Touring All-Season tire developed for the drivers of crossovers, sport utility vehicles and prestigious pickups. The Ecoimpact* icons on the sidewall of the Scorpion Verde All Season highlight its environmental compatibility where it reduces rolling resistance and tire weight to increase fuel economy and lower the vehicle’s CO2 emissions. The Scorpion Verde All Season is designed to combine dry and wet road handling, comfort and year-round capabilities, including all-season traction in light snow. The Scorpion Verde All Season molds a silica tread compound into an asymmetric tread design that features an optimized rubber-to-void ratio and uniform contact patch to blend dry road traction and performance with uniform wear. Four wide circumferential grooves displace water to resist hydroplaning and enhance wet traction while longitudinal siping for lateral stability on loose surfaces and high-density lateral siping enhance wet and wintertime traction. Derived from Pirelli’s legendary P Zero performance tires, the Scorpion Zero is a All-Season tire for sport utility vehicles and pickup trucks. The Scorpion Zero was designed to provide year round traction and handling for drivers who operate their vehicles primarily on-road in various weather conditions, including very occasional light snow.